This is a complete castle with a moat and a drawbridge. Built in 1985. The 3-story tower includes the master suite and living quarters. There is an additional 2 bedrooms with their own full living quarters. A 1100 sq ft garage and a shop. All this is enclosed in the high walls of a fortress. (The Castle). There is tiled floors and carpet, an elevator and staircase to the 3rd floor master suite. Electric heat, and besides a full kitchen there is a complete antique wood burning cook stove. The compound encloses the living quarters and battlements. All together in the compound is 3 bedrooms, 3 baths and 2 kitchens. Across the moors is a small lake with an island. Next to the lake is the "Sheriffs Quarters", (or a guest house). All this on 5.34 usable Acres. I have a little more info. on the Unknown Castle in Vancouver, Wash. The structure is in Camas, Wash., just east of Vancouver. It is built of concrete and can be seen from the road. The property has been withdrawn from the market but will be put back up for sale in the summer. If you want to see it, just go to Camas and ask at any real estate office. 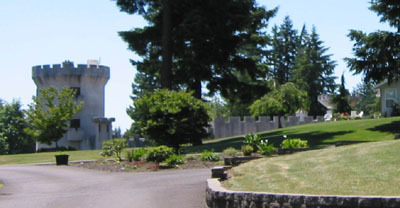 With regard to "UNKNOWN CASTLE in Camas", as mentioned on your webpage about the castle it's one of three featured in a chapter of Chuck Palanhiuk's "Stranger Than Fiction" called "Confessions in Stone", which I've just finished reading. The castle was built by Jerry Bjorklund. He began it in 1983. It has a three-storey, 40-foot keep at its east end. Two wings extend west from the keep, enclosing a central courtyard. The keep is roughly 1500 square feet (500 per floor); the wings are roughly 1000 square feet each. After church services in the mid-1980’s, my family would drive past the castle when it was only the main keep. A few years later as a teenager, I rode my bike by this castle many times since I lived no more than 3 miles from it. I saw most of the construction throughout the 1980’s. Around 1990, my friend had the nerve to ride up the private driveway and knock on the door of the main keep. A large man answered and my friend asked if it was open for tours. Of course the man said ‘no’ and we left. It appeared to be modern decor inside the keep. While on vacation back to my hometown of Camas, I took a couple of pictures in 2002 from the road running nearest to this castle without trespassing. It is located on a hill east of Lacamas Lake in Camas, Washington. Thanks to your site for helping me find this building. I saw it from the road once but could not find it again. P.S. - Additional information can be had from the clark county property information pages and the gis maps. From here check out the misc tabs, then go to "maps online". Use the information pointer tool (upper left - the letter i with a circle) and click on the property. You can also check out the neighbors. Be sure to check out the birds eye view. Does anyone have more information? Does this castle have a name? Photo courtesy of Gabe Nickelson.